Shopping in Ocho Rios, Jamaica will bring you fine products at exceptional value. In fact, your cruise ship will give you a list of stores that are specifically chosen for their wide selection of goods, great value per item and noteworthy customer service. Additionally, the stores that your cruise line recommends generally offer some buyer's guarantee. For Carnival Cruise Lines' passengers, there is a 30-guarantee that they fully back. Generally, on the day before arriving in the Ocho Rios Port, your cruise ship's Shopping Specialist will host a pre-shopping event in one of the lounges (check your daily agenda for venue and time). During that time, he or she will give you an overview of the stores; share shopping tips; and in some cases give away coupons to redeem free items or secure discounts from recommended stores. 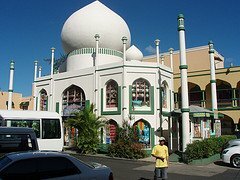 There are four major shopping areas, each with several stores, that offer fine jewelry, duty-free items and authentic, locally-made items in Ocho Rios, Jamaica. The four shopping areas are Island Village, The Harbour Shops, the Taj Mahal Shopping Centre and Soni's Plaza Shopping Centre. 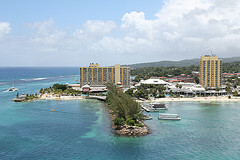 The first 3 shopping areas are a short walk from the Ocho Rios Cruise Port. However, Soni's is a little farther away, but you can still get there on foot in a relatively short period of time. Let us look some of the stores found in each of the four shopping areas mentioned above. 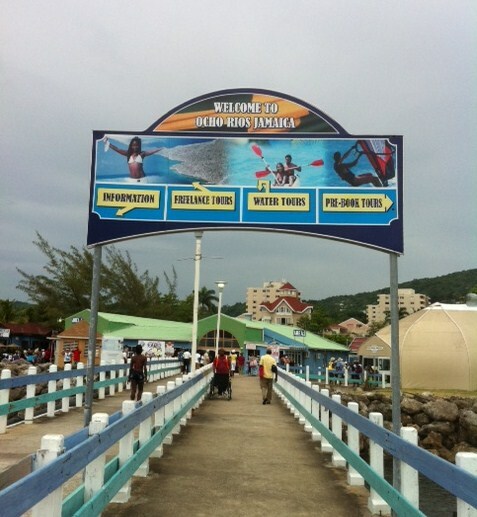 This is the closest recommended shopping area to the Ocho Rios Cruise Terminal. * You will get a bottle of Jamaican rum with each jewelry purchase. ** Gem Place is also located at the TajMahal and Soni's Plaza on Main Street. This shop was established in 1958 and is dubbed "The Luxury Shop" of Jamaica. Jewelry Specials such as the Diamond Insert and the Reverso Ring. **A Casa De Oro store is also located in the Taj Mahal Shopping Centre. If you are shopping for tanzanite in Ocho Rios, put the Gold Mine on your list. They sell Parazul handbags and accessories plus yellow, blue and pink diamonds. **A Gold Mine store is also located at Taj Mahal. 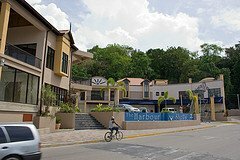 After exiting the gate at the Ocho Rios Cruise Terminal and continuing straight ahead, you will walk right into the Harbour Shops. Some of the main shops are listed below. Find over 10,000 pieces of diamond in blue, yellow or pink to from which to choose. Additionally, you will find Sophia Fiori blue mist diamonds and pink petals sapphires. You will also find Ammolite by Korite - the sleeping beauty of the sea! Have you ever worn bamboo? Well, now you can! Cariloha turns hard bamboo into soft apparel - twice as soft as cotton. Expect to find bed and bath "bamboo" goods, such as ultra-soft sheets and towels (ship them home for free); and leather bags featuring an exclusive bamboo fabric liner. ** Ask how to get a free bamboo lei. Take pictures with the Piraña. 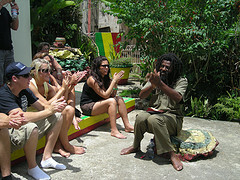 There are several recommended shops to visit in Ocho Rios. Four have been described above: House of Diamonds, Gem Palace, Casa De Oro and Gold Mine. The fifth shop is Jewels & Time found at Taj. *Be sure to check out their Bulova, Fruitz and Philip Stein collections. 1. Johnny Rasta - Shop here for handmade Jamaican pottery (Wassi Art), Blue Mountain Coffee, plus organic and natural body care products. 2. 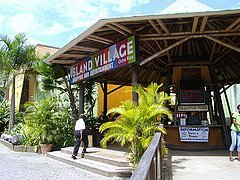 Jimmy Buffett's Margaritaville - You cannot complete your shopping in the Port of Ocho Rios without eating. Find great food and drinks at Jimmy's. What Currency Is Accepted in Jamaica? Jamaican vendors will accept the US Dollar, Canadian Dollar and the British Pound. Generally, items are listed in US dollars. 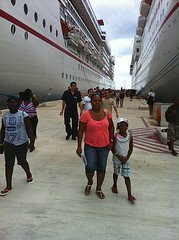 Remember that whenever you book your inclusive family Caribbean cruise, if your plans include shopping you will get additional information onboard your ship. Each cruise ship has a Shopping Specialist who will host seminars and provide pertinent information before each port of call visit. You will be well armed with information when shopping in Ocho Rios.